"Bo Shuda!" My following interview with puppeteer Toby Philpott is one of my favorites. 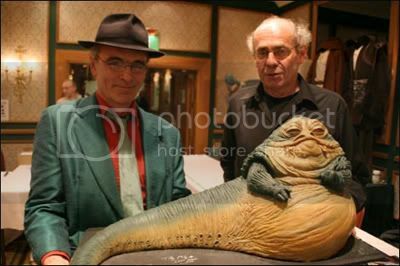 Not only did he operate Jabba the Hutt with a team of puppeteers, he also worked on the Jim Henson classics the Dark Crystal and Labyrinth. The following interview is published for the first time in english after originally being translated in dutch for a Star Wars website. Enjoy. What got you into puppeteering? Was it a movie, an experience or something else? Well, my father did puppets, and also taught hundreds or thousands of people how to make and operate puppets - for entertainment, educational or therapeutic uses - so I got to play with different kinds of puppets as a child, and considered it fairly normal for adults to ‘play with dolls’. I also saw all kinds of delightful puppet performances (not just the usual kids’ shows) by grand masters from different countries – Balinese rod puppets – done with shadows), French marionettes, Russian hand puppets, etc. In the UK puppets did not have the respectful attention that they have in many other cultures – and most people only knew Punch & Judy. I didn’t take up the family business - (unlike David Barclay, who both builds and operates puppets, like his parents) - but went into circus skills and theatre. When traveling in Mexico, and beginning to make my living from juggling and magic, I made a sock puppet of a snake with which I could improvise with the kids. In the seventies I mostly got into circus skills, but with a small troupe called Abrakadabra I still found myself doing some puppet and mask work. After my dad died I got a bit down about clowning for a living, and went to retrain on a mime course. While taking that course I heard about the call for The Dark Crystal (‘mimes, dancers and acrobats wanted to operate large creatures’) and went for the job. Even my dad (who generally didn’t like television puppets) thought Jim Henson a genius, so it seemed a fitting move to make in his memory. After spending most of a year on The Dark Crystal, (excellent training) I got called in to help with Jabba in Return of the Jedi. Phew, well, I don’t currently work in show business. After thirty-three years as a freelance performer and teacher, I moved out of London and took a job with the local library in Cardiff (where I now live). After learning the basics, I moved into the computer department, and now help administer staff computers in a network of nineteen buildings, and all the public internet access. This has led to my creating a website, and the web made me aware of the Star Wars convention circuit, so I can sometimes be seen meeting the fans at those sorts of events. I also hold a position as member of the board of NoFit State Circus (who I helped start up, and later performed with) who have moved into the international market, and tour with a large company of performers. I also help run the blog and quarterly online magazine for the Maybe Logic Academy, an online study group. How did you get approached for Return of the Jedi? I haven't heard of Richard Robinson. What did he do in Return of the Jedi? Richard both built and operated puppets for a living. I guess this is still him, building puppets for The Wright Stuff. I remember he played Bungle on children’s television, and later worked on the savage satirical TV puppet show Spitting Image. I don’t know exactly who they gave him to do in Return of the Jedi …a Calamari, maybe? How long did it take to film the scenes involving Jabba? A good question, that I can’t answer without call-sheets, etc from the period. I think we did about two, three weeks in the main palace, a few days in the ‘alcove’ near the carbon ‘ornament’ of Han Solo, and maybe a week in the Barge (death scene). And no, we didn’t get to go to the desert, we only did interiors at Elstree. 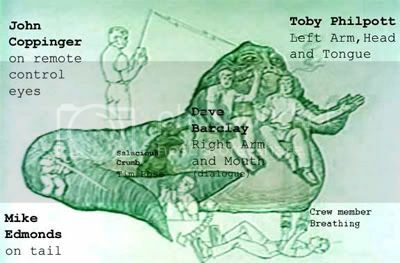 What difficulties did you experience working inside the Jabba puppet? Was there any negative experience that stands out from trying to get him to work? Funnily enough we must have had problems, but I don’t remember them, and none of the other guys I have spoken to have come up with any stories. We must have had small technical problems, of course, but managed to avoid disasters. 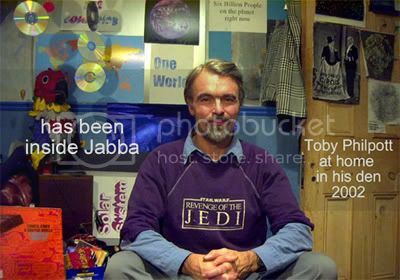 Jabba worked – he came alive. All credit to the team of builders who rarely get enough credit for Jabba’s presence and performance. Since Jabba was made of a latex-type skin, was there a ‘smell’ to him? I imagine that with three performers sweating inside his immense bulk that personal hygiene was a must as well. Was Jabba ever a prankster between scenes? I don’t think we dared improvise jokes in that situation. We had our reputation to think of – and the need for respect! We left silly stuff up to our jester Salacious Crumb, puppeteered by Tim Rose. As Tim operated Salacious alone, and spoke for him, he could improvise in classic puppet mode – without all the co-ordination and discussion we needed to work Jabba. On the Return of the Jedi set you were surrounded by a lot of actors including Harrison Ford, Mark Hamill, Carrie Fisher and Anthony Daniels. What were these four actors like on set? You have to understand that Dave and I climbed inside Jabba in the morning, and spent most of the day there. We could see a tiny monitor (which just showed us Jabba) and a headset (but we had to stay disciplined about radio silence, and listen for instructions). One of our crew would stay outside with the radio-control for the eyes, and they would talk to the director and actors about a lot of the moves we had to make. So I had little contact with the actors, directly. Mr Daniels had such an uncomfortable costume that a body double would stand in for lighting, etc. Similarly, stars have body doubles for lighting and sound and blocking moves. I occasionally had a word with Carrie Fisher, when we had something tricky to do (so she would understand how little we could see), and I bumped into Mark Hamill in the costume department (he had no idea who I was, of course, even though we had played scenes together). I didn’t really get to talk to Harrison Ford, who had already become a bigger star than the others (Indiana Jones) and only had a brief scene with us when Leia had got him out of the carbon…Anthony and I did have some serious discussion about how I could knock him down safely (with Jabba’s left arm, and unable to see anything much) and we eventually set him up without the ‘robot legs’ so that he could stagger back safely. He was a real trouper about that. Richard Marquand directed Return of the Jedi and George Lucas was on the set a lot, too. How would you describe them? The same answer as with the actors. Dave, Mike and I had little idea about any tensions on set. Sometimes someone might mention that George had turned up, but we didn’t really know as much as those outside. Richard Marquand seemed fine to me (he mostly talked to our front man) – and accepted our request that he talk to Jabba as if real (rather than say “Toby, can you move the left arm?”) so that we could practice continuously, and because it helped sustain the illusion for the other actors, the techies, etc. You mean that although you had little idea, there actually were tensions on set? Call you tell us more about that? I just imagine it to have sometimes felt uncomfortable for Richard Marquand to get put in the role of director – with George still hovering around – but assuming George delegated properly then perhaps his presence proved helpful and supportive. I have heard speculation about the situation, but have no new insights or stories to offer in clarification. You mentioned that when Jabba was spoken to by Richard Marquand, that he refer to the Hutt ‘in character’ to preserve the illusion. How successful was that process? That worked fine. He and everyone addressed us as an actor, and we could improvise answers (David speaking in English over the speakers), or demonstrate moves. When the heat and attention was off us we could then hone those improvisations with highly detailed analysis of what we needed to do, in sequence, coordinated with the eyes and tail, etc – either discussed on our headsets, or simply arranging to meet outside Jabba for a chat. 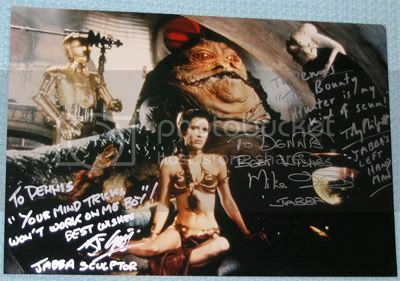 What do you make of the Star Wars fans that are so dedicated that they’ll stand in line to get the signature of one of the crew who puppeteered and/or built Jabba the Hutt? I find it odd, but only because I don’t collect autographs. I myself have stood in line for hours to see some of my own heroes, and sat through some long, boring shows just to catch one circus or variety act I wanted to see live. I think a lot of the fun comes from sharing a ‘world view’, and taking sides, and dressing-up and playing roles. I got paid to do that, I didn’t do it for fun! You have worked with the legendary Jim Henson on various occasions. What is in your opinion the one thing that really defined him and has made him the pioneer regarding puppeteering? As my dad worked simple puppets (he may have done the first ever television broadcast of primitive puppets, in 1932) the sophistication of Muppet design and operation seemed innovative and flexible for the performers. Unlike puppets done in badly designed sets in tv studios, Jim had whole sets designed so that the puppeteers could work in as much comfort as possible. The family orientation of the Muppets’ humour (with some wicked jokes aimed at the adults) gave them mass appeal. Jim always said that Frank was the funny one. The two of them combined to generate and encourage that madcap energy. The Henson creature shop had already created Yoda, and I think that Jim wanted to do The Dark Crystal both as an experiment to get away from the Muppet-look, and as a showcase of what animatronics could do. In The Dark Crystal you played the Alchemist, one of the mystics. How long (and how hard) did you have to practice the movements and were the movements based on something like an animal for instance? I only get a credit for the Alchemist, because to explain what each of us did would take forever. I guess I contribute to almost every shot in the film. As well as my Mystic (and occasionally doubling for other mystics) I played Garthim, background characters like Pod People, even swamp creatures, etc. Each of us also got attached to a senior Muppet puppeteer, as part of a team, because these complex creatures sometimes needed three or four people to work them. I felt very flattered to get picked for Jim Henson’s team (along with Robbie Barnett). This means that when Jim’s characters (mainly Jen and the Ritual Master) appear in a scene, I may well be working the right arm, or the eyes, etc. We did a lot of work on the back stories for the Mystics, but the Skeksis get more screen time – you see the Scientist’s lab, for instance, but not the Alchemist’s experiments. The movement and the creature designs evolved together. I don’t think we specifically imagined an animal – although old and slow did lead me to think of a tortoise, for instance. Puppets and animatronics versus CGI. With CGI it seems that the art of puppeteering is fading. Less and Less things in movies are done with puppets. Is this a good thing or a bad thing? I don’t really see this in either/or terms. Puppets have a long history of live performance, and this will continue - I think - in small theatres, the streets, and on live TV (announcers, kids’ shows, etc). Similarly, CGI seems like a modern version of what Disney did by hand in the thirties (not exactly new), and what stop-frame guys achieved, etc. So here we are talking about the Special Effects Department, who will use whatever seems necessary to get the shot in the can. Ideally, you don’t feel aware of SFX – say in Jurassic Park (a mixture of CGI and occasional real heads and feet of dinosaurs, etc) – where the effects seemed seamless and convincing to me (by not dwelling on them too long). I don’t play computer games, so I don’t like the slick hyper-reality look of the more recent sci-fi films – it doesn’t look real to me – perhaps a generation used to simulations accept them more than I do. One advantage of puppets (as I mentioned when talking about live shows) comes from their ability to improvise, to change a performance (either because the director has a fresh idea, or because the actor changed their way of playing the scene). Our Jabba actually plays with the actors, he genuinely ‘acts’ on set, and had real presence (sometimes quite scary). I find that a really tough question. Well, pair of questions. Perhaps I enjoyed eating the frog (Jabba) just because of the effect it has, using my left hand as his left hand, and my right hand to tilt the head, and then quickly slide it inside the tongue, to lick the lips. Nobody cares how that got done, but I enjoyed the dexterity and co-ordination of that shot, and the final effect. In terms of fun, I suspect the night-shoots (second unit) at the Acme Factory for Who Framed Roger Rabbit, as we had to improvise all sorts of solutions to problems of making ‘reality’ look like a cartoon. Which character you have puppeteered is your favorite? I actually greatly loved the Alchemist in The Dark Crystal, even though his back story did not get introduced to the film. The position we worked in was extremely uncomfortable, and we could not get out for a rest very often, so I developed a very yogic approach to the pain, discomfort and boredom – and fell into a kind of resigned and patient trance that felt very suitable to the character. You have worked with Frank Oz; who used to puppeteer a lot but is now a director of non-puppet movies. Now that Jim Henson is no longer with us, do you think he should go back to puppeteering since no-one has filled the gap that Jim Henson has left? Do I think he should do it to ‘fill the gap’? No, not really, as he always was a comedy performer, writer and director, so he just adapts to different kinds of material. I last worked with him when he was directing not performing (Little Shop of Horrors) so I have already got used to the idea that he had moved on. How was it to work with the great David Bowie on the set of Labyrinth? I enjoyed it, although I had some back problems at the time. He seemed very laid back, and ‘normal’. He didn’t go off to his caravan like a star, but hung around with us guys at the tea trolley and even blagged a cigarette from me (no pockets in his tights) and chatted for a few minutes. We ended up talking about a little café in Soho we both used to go to (although at different times). Another time I was juggling (a warm-up, and aid to relaxed concentration) and dropped one of the five balls, which bounced across the room, rather out of control - he caught it while walking past, and tossed it back without missing a beat. Seemed like a nice guy to me, and he just got on with the work. There will be a Star Wars television series and a sequel to The Dark Crystal. Any chance we will be seeing you back in one or both of them? Another difficult question. Do you mean among available characters? I guess I’d love to have a go at Fozzy Bear, but secretly I’d prefer to do Animal on the drums! I don’t know how many famous puppets you can think of. A British performer called Rod Hull had an Emu puppet that attacked presenters of chat shows, etc, which I enjoyed. I quite like the weirdness of ventriloquist dolls, and experimented with that skill at one time. If I could pick any character at all, then perhaps I’d love to try to do Buster Keaton as a puppet. A real challenge – perhaps as a string puppet? Did you see the extraordinary puppet work in Being John Malkovich? I have to say, I don’t show much talent for marionettes (they feel mime-like and weightless like a ballet dancer). I like glove puppets, single performer body puppets (think Big Bird) all the way up to full body team puppets, that have real muscle and bone inside them, real nervous systems and personality and presence. I really enjoyed this phase of my life, helping create such characters and illusions. Great that people still appreciate the work.